Todays prompt is yellow and lately I have been having a little love affair with yellow polish. So I tried to make good use of a few. Let me show you. I made stamping decals. They aren’t new here on the blog as I made decals with the same image before but Since then I have had this idea and the yellow prompt was the perfect time to do it. I started by making my decals first. I used BM422 to stamp with black and on 3 I filled in the spaces using Sinful Colors – Snow me white. On the other 2 I made a few with Sinful Colors – Anchors away, a few with Sinful Colors – Pull over, a few with Sinful Colors – Daisy daze and filled all the rest with China Glaze – Lemon fizz. I left those to dry. I then painted my pinky, index and thumb with 2 coats of China Glaze – Lemon fizz and my ring and middle with 2 coats of Sinful Colors – Snow me white, leaving them to dry completely. When everything was dry and ready I applied the decals. I used the white decals over the yellow polish and the yellow decals over the white polish. I really loved this and it was so striking. I couldn’t stop staring. Once it came time to go through the photos I could of course see all the mistakes I made. It’s not perfect but it took me ages and I loved them anyway. I’ve already shown you Sinful Colors – Anchors away and Sinful Colors – Daisy daze (you can find the swatches under the ‘swatches’ tab in the menu and if you click on them you can go to the post) so I am going to show you the other two yellows I used. This is 2 coats with no topcoat. It is a orangy yellow and I had no problems with the formula at all. It was a little sheer at first but built up well on the second coat. I’ve heard some people complain about the formula but it wasn’t that bad for me at all. It’s not as creamy and buttery as Anchors away for sure but completely fine. I didn’t think I would need Lemon fizz because I have 3 other pastel yellows as well but this is unlike any of them. This is 2 coats with no topcoat. Formula was great and opacity was lovely too. This is such a unique yellow in my collection, pastel yet bright. I love it. What do you think of all the yellow happening here today? 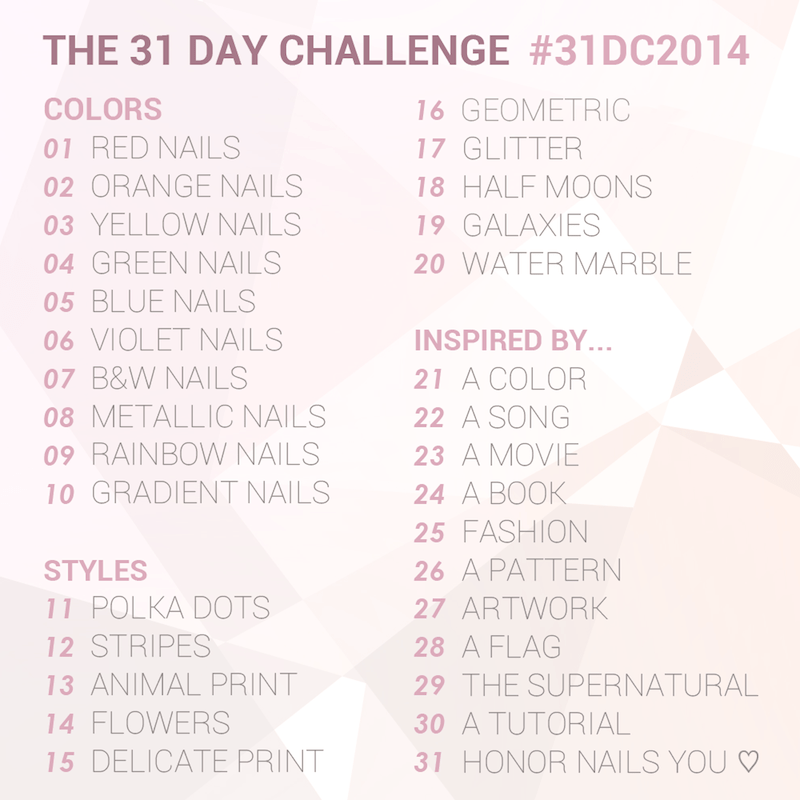 Are you following along with #31DC2014? Here is the poster of prompts so you know what you can expect 🙂 Don’t forget to check out other posts following todays prompt by using the Inlinkz goodie below or following the #31DC2014 on all social media platforms. Heehee I did bees and you did honeycombs 😀 They look great, so cute! Thank you so much Paulina. WOW I love the first photo with the decal, so stunning! Thank you so much Desiree. I love this stamp, and you did this to perfection! I love it. What a clever idea to invert the colours. I’m not a huge fan of yellow, but I’ve been enjoying wearing it lately. Oh, man, nice work with the decals. I don’t see any imperfections!